Have you ever spent hours; maybe even days, looking for a particular recipe that you made and loved but can't seem to remember where it came from. Well that's exactly how I spent my day today. I woke up this morning thinking about a calamari salad I made at the end of July for my uncle's birthday. I remembered it being really good and I thought I should make it again soon. But for some reason I just couldn't remember where I got the recipe from. The search began right after breakfast. I scoured through cookbooks, magazines and newspaper clippings. I searched the web and checked all my favorite blogs. 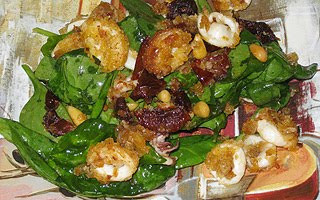 Do you know how many calamari salad recipes are out there. Well there's lots; but not the one I was looking for. I called my mother for moral support. "Yes, I remember that," she said. "You should make it again." Well I'm sure trying. She did remember that it had pine nuts. Ahh...another word to add to my search. Finally, after hours of driving him crazy, my husband chimed in and said, "Didn't you take a photo for your blog?" He's always full of good ideas. Although, I had never gotten around to blogging about it I knew I had taken a picture. So we went to look at the photo. "What are those big reddish brown things?" he said. They almost looked like bacon but I didn't think so. Then it dawned on me...they're sun dried tomatoes. My search began again. This time I went through everything looking for recipes with sun dried tomatoes; and right there on page 26 of Nick Stellino's Family Kitchen cookbook I found it! Rinse and clean squid thoroughly. Slice into rings. Toss squid with the bread crumbs. In a large nonstick saute pan, heat olive oil over medium high heat until the oil sizzles. Pat excess crumbs from the squid and fry until firm and golden brown, 1 to 2 minutes. Heat remaining olive oil, add sun dried tomatoes, pine nuts, basil, garlic, lemon zest, red pepper flakes, salt and pepper. Cook about 6-8 minutes. Return calamari rings to pan and toss until well coated about 2 more minutes. Toss with the arugula (spinach) and lemon juice until the greens wilt slightly. It has been ages since I last had calamari. The salad looks really great! I am laughing out loud! I can't tell you how many times I am turning over pieces of paper looking for a recipe. That is one of the best parts of blogging! I can relate completely! I'm glad that you figured out where the recipe came from. Thanks for sharing - looks delicious! Mmm...I often go through my old recipes just to remember what I used to cook. This looks yummy! I used to do that all the time, but now that I blog almost everything I make, it makes searching a lot easier. (I just need to click on a side tab). This is the perfect example of why pictures are worth a thousand words ;). Delicious salad! So glad you found the recipe to share with us. Absolutely must try recipe. Sounds so good Food Hunter! I have been looking at recipes for squid lately.. this looks wonderful! MMMMMMMMM,....your squid recipe sounds so tasty to me & my husband!! Looks marvellous too!